In an effort to dredge up my entire life history on this blog, I present you with perhaps the most important letter I have ever received. For the full back story, please read this post. 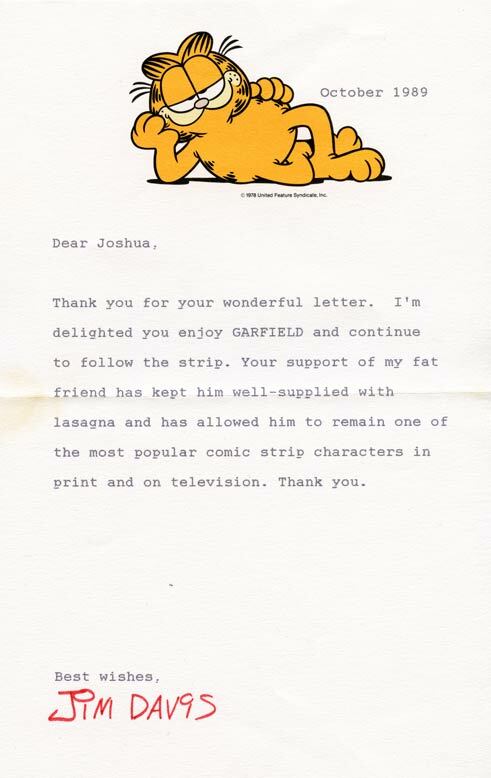 The short version is: when I was a kid, I wrote a letter to Jim Davis, creator of Garfield, imploring him to stop the exploitation of his characters. What I got back was a very nice form letter. He did sign it, at least. 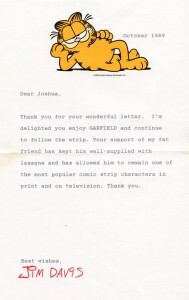 This letter changed the course of my life. Soon after, I started reading Calvin & Hobbes. Bill Watterson’s strict ethic about his work and the control of his characters resonated with me. I had seen the dark side, and I never wanted to look back. Now that I have my own comic strip, I look at Jim Davis and Bill Watterson’s ideas as opposite sides on a spectrum. There is plenty of ideological space between the two. Note that I’m not against licensing my characters. But when that fateful day does come, I will have a balanced view. I’m glad I had this devastating experience as a kid, or I wouldn’t be the fully-formed adult I am now. Why didn't this occur to me before? You totally need a form letter.